"Jen is a true furniture artist with a great eye for a clever design fix. Easy to follow step-by-steps accompany each stunning makeover. Your only difficulty will be in deciding which technique to try first!" "Jen doesn't just give a piece of furniture a fresh coat of paint, but elevates it with her imagination and attention to detail." "Stumbling across an amazing old piece of secondhand furniture that's full of potential always makes my heart go pitter-patter, and this collection of ideas (from painting and adding hardware to completely transforming these old pieces) feels just as fun to stumble upon! Color me inspired!" 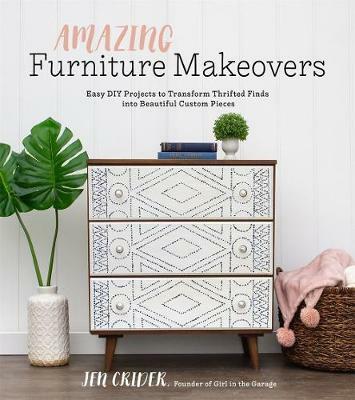 "Jen's book, Amazing Furniture Makeovers, is truly that...amazing! I've been refinishing furniture for 25 years and I'm astounded at these furniture makeovers that Jen has created and how easy it is for anyone to do. This book is a must buy!" Jen Crider is the founder of Girl in the Garage. Her work has been featured in Better Homes and Gardens, Woman's Day, Country Living, and This Old House. She lives in Valparaiso, Indiana.